Celebrate cycling and all its positive aspects. Claim your right to the road. We are traffic! Bring your bike, your helmet, your lights, a noisemaker and your friends. The ride is usually followed by a drink or a meal (or both) and you can chat with your fellow cyclists about cycling activism. You can even help plan the next World Naked Bike Ride. Deaths and injuries to pedestrians and cyclists are caused by motorised vehicles. Worldwide it was estimated that 1.2 million people were killed and 50 million more were injured in motor vehicle collisions in 2004. We need a peaceful and gentler world which includes our roads. Means "Working Together" in Mandarin. It has come to mean boundless enthusiasm and application. Please be inspired to be Gung Ho about Critical Mass! Celebrate cycling and all its positive aspects. Claim your right to the road. We are traffic! Bring your bike, your helmet, your lights, a noisemaker and your friends. Join us to demonstrate the need for a network of safe cycle routes! Assert our right to ride on roads, and not in the car door opening death “lanes”. 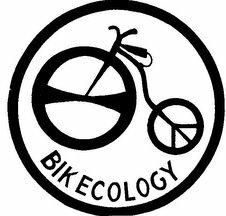 Grassroots, sustainable bike culture in action! This is the only monthly safe, sustainable bike ride in Newcastle : We don't encourage cycling in the car door opening death lane. It's not very syustainable to ride in car door opening death lane for too long, eventually you will get hit by an opening door. See "*** Stop cars annoying you - some riding in traffic advice ***" for more info. The NBEC gives away 1 working bike for each critical mass bike ride. When you complete the ride you get your "deposit" refunded.